One of the most popular small cabins we featured last year was a cabin modeled after a forest fire lookout tower. 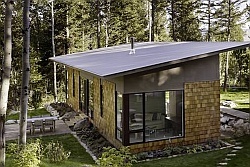 Today we have another small cabin in the woods designed by the same architect, David Vandervort. But while the previous project was quite rustic with an unfinished interior, this one features refined finishes and millwork. It was placed on a sunny bluff in Washington’s San Juan Islands, surrounded by madrone trees and towering cedars. The Orcas Island cabin is a gable-roofed structure with lean-to extensions on either side. All four corner were notched out to create a cross-shaped floor plan. The corner notches are used for the entry porch, firewood storage and small covered sitting areas. Inside there is 350 ft2 (32.5 m2) on the ground level plus a 150 ft2 (13.9 m2) loft. The cross shape creates distinct spaces within the small floor plan. The kitchen, dining nook and bathroom each occupy one of the resulting alcoves. A ladder provides access to the loft bedroom, where shed-roofed dormers add some headroom. The exposed beams supporting the loft were milled on the island from fir trees that came from the site. French doors lead out to a flagstone patio integrated into the landscape with a meandering edge. The same stone was used for a durable floor covering at the entrances and beneath the woodstove. If the floor plan intrigues you, Quietude was another featured project that used a cross shape to differentiate spaces in a small house. Images courtesy of David Vandervort Architects. Beautiful! It’s a shame no pictures of the sleeping loft was available. 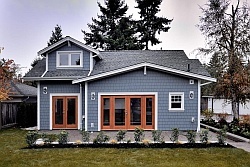 I love it….I would move in right away….more info? too bad we couldn’t see the sleeping area. I really like that detail where the two columns are underneath a small boulder. I left a message yesterday (6/28/13). 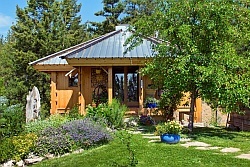 I am interested in this cabin, to be built elsewhere in Washington State. I would like to know the total cost of it. Would you please reply? Hi Christine, for information on costs and plan availability you should contact architect David Vandervort directly. His email is david@vandervort.com. 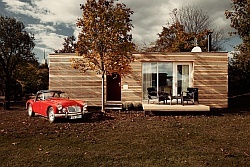 Whether you build a version of this cabin or another design, consider sending some photos our way. 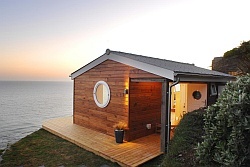 I love many of these small houses and enjoy looking at the various designs. However, I’m discouraged that so many feature loft sleeping arrangements and ladders. I want to age in place with my husband, and I see that solution as unworkable. I know it gives a home a smaller footprint and uses fewer materials and resources — but can’t you come up with some other solutions to address this? Thanks. 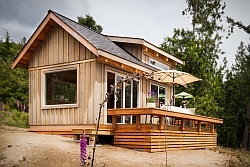 Very excited to find the Orcas Island house with plans! We are planning to build our dream tiny house in roughly 8 years around the Red Feather Lakes CO area. I think this design is the one! I do agree with Jeff and would love to see the loft area as well. Hi, have you found anyone that is building out in that area? I have been doing research but can’t find much.